Dragon's Den: What Happened Next? 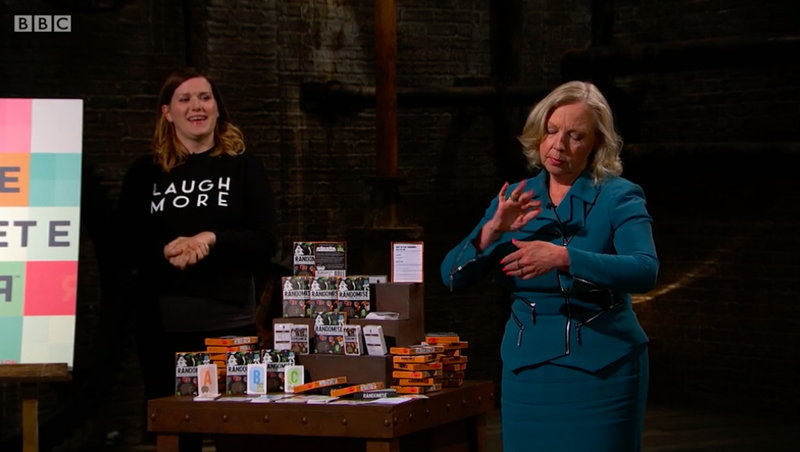 How great was Deborah Meaden playing Randomise on Dragon’s Den? She totally got into the spirit of our company and watching her act out a ‘Gentle Punk Selling Lemonade’ on the show was almost as hilarious as watching her do it live. The editors did well to cut out my distracting belly laughs while she was acting! Seeing myself on the TV screen was just as bizarre as I’d imagined - it felt a bit like an out of body experience… But wow, what an experience to have survived the Dragon’s Den. If you watched the show you’ll know I got an offer of investment from Jenny Campbell and I am so grateful for this - it has given me a real sense of validation to know that she believes in what we are doing. So why did I turn her down?! On the show it certainly seemed like I’d made a surprising decision - not least, after I’d left the studio, when Peter Jones declared ‘She’ll live to regret that!’. But honestly, it didn’t feel that surprising at the time - the final offer, with it’s two-year payback period, just didn’t suit our plans for growth that is sustainable in the long-term. It might look like I made a quick decision - but in reality I spent more than an hour in the den, detailing all our financial history and conservative forecasts, exploring our company’s value with the Dragons. Of course, at the time, I would have taken an investment offer at the price we set - as a team we’d agreed this would be worth it for the expertise a Dragon would bring. However, we are now reconsidering whether we really want investment to ‘supercharge’ our company or whether growing more organically (investing our profits into creating and printing more games each year) is a more sustainable and enjoyable route. Will I live to regret my decision? Who knows! But right now, no regrets. I feel like we are in a great position, building a good company for the long term benefit of our customers, our team and our world. Watch this space!